Its a simple, Pay As You Go system. You fill the liner with one type of plastic either Silage Wrap, Fertaliser Bags, Plastic Drums, String Etc. and then once it is full, we come and collect it. Or you can drop it at our yard yourselves. We charge per liner to collect depending on how many liners you have. How does the bin system work? Place your bin in a convient place next to the souce of waste, to make it easier to fill and keeping the area tidy. By pulling the liner down the outside of the bin you get maximum space to fill inside the liner and enough room to tie the liner up once it is full. Once full, tie the liner using large cable ties or string and then remove the bin from the liner. Use a bale grab or forklift to move the liner to a more convient place with suitable access for the collection lorry. 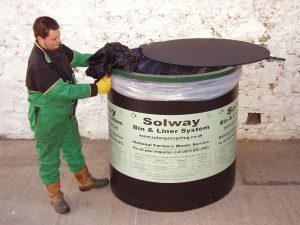 Liners will be collected on a pre arranged day with yourselves and will be visually inspected to ensure they contain the correct materials. What plastic can I put in the liner?